As you prepare for your trip to Fluor Field at the West End, please see the following alphabetical guide regarding stadium information and policies. We hope you enjoy your experience at Fluor Field, and we appreciate your support of the Greenville Drive! - Service animals are allowed inside the Fluor Field gates. All other animals are not allowed inside, with the exception of Bark in the Park days. - A TD Bank ATM is located next to the Splendid Splinter concession stand on the third base side of the concourse. - To provide a safer environment for the public and expedite fan entry into Fluor Field, the Greenville Drive bag policy limits and restricts the size and type of bags that are permitted into the stadium during Drive games, collegiate and high school games, and any other in-stadium public event. For more information on what is and isn't allowed inside the Fluor Field gates, please visit our BAG POLICY page. - CLICK HERE to view the Fluor Field Ballpark Map page, which also includes ticket prices. - The Drive Box Office on Main Street is open on all game days through the 8th inning. It opens at 10:00 AM Monday-Saturday and 12:00 PM on Sunday. On non-game days, the Box Office is open from 10:00 AM to 6:00 PM Monday-Friday, and 10:00 AM to 4:00 PM on Saturday. The Field Street Box Office is only open on gamedays, beginning when the gates open at 6:00 PM. - Fluor Field has seven concession stands located around the main concourse. Splendid Splinter's on the third base side and 7th Inning Stretch on the first base side serve traditional ballpark fare, including hot dogs, burgers and more. Que's BBQ is located behind home plate and includes pulled pork, brisket and a variety of sides. Carrera Cantina is also located behind home plate and features tacos, burritos, quesadillas and more. Sweet Caroline's, located just above the TD Bank Family Terrace inside the Main Street gate, serves all your favorite ice cream flavors. The Drive also have a Subway stand behind home plate and a Chick-fil-A stand on the first base side. - The Drive Info Center is located on the concourse above section 107. Stop by here any time after the gates open if you have questions that arise during your time at Fluor Field. Updated rosters and lineups will be provided here prior to each game. - Drive Magazine is produced each month during the season, and it is complimentary as you enter the Fluor Field gates. Drive Magazine includes feature stories on Drive players and coaches, updates on the daily happenings at Fluor Field, and advertising for many local partners around the Upstate. - The only elevator at Fluor Field is located at the suite entrance off Field Street on the first-base side. Take the second floor to the main concourse, or the third floor to the suites. - Please relay any emergency situations to the nearest usher at your section, or to the Drive Information Center at section 107. - All fans are expected to conduct themselves in an appropriate manner. Anyone trespassing on the field, throwing anything onto the field, using abusive and/or obscene language, or those deemed intoxicated will be subject to ejection and/or prosecution. If you witness a violation of any of these policies, please contact a Drive Game Day Staff member. - If you are in need of first aid, please visit the Drive Info Center at section 107. - All guests at Fluor Field should be alert for foul balls, bats or any other objects that may leave the playing field at any time. - The Fluor Field gates will open an hour before that day's first pitch, unless advertised otherwise. A majority of home games Monday through Saturday begin at 7:05 PM, while most Sunday home games will begin at 3:05 PM. To view the 2019 Drive schedule, CLICK HERE. 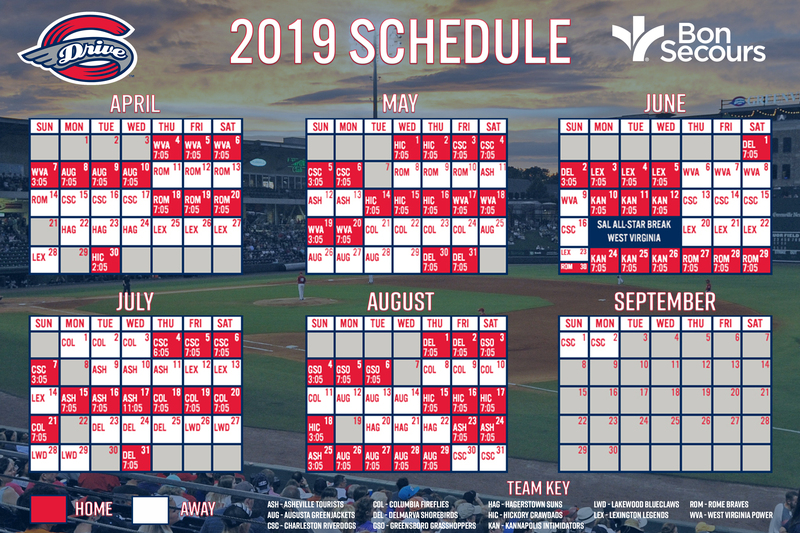 To view a printable version of the 2019 Drive schedule, CLICK HERE. - Fluor Field is the perfect place to have your group outing, featuring Drive baseball, great food and a good time for all. Call our front office at (864) 240-4500 to set up a group outing for a Drive game, or CLICK HERE to reserve online or to gather more information. - No matter the size of your group, Fluor Field has a hospitality venue for you! The venues available include our luxury rental suites, the Champions Club presented by Hubbell Lighting, the Rooftop at Fluor Field, the Mountain Dew Dugout and more! CLICK HERE for a full listing of hospitality options at Fluor Field. - Audio broadcasts for all 70 Drive home games at Fluor Field are available online at greenvilledrive.com. The audio stream is complimentary, but an MiLB.TV subscription is required to watch the video stream of Drive games. - You can inquire about lost items or turned in items at the Drive Info Center at section 107. - Drive merchandise is available year-round at the Drive Team Store located outside the Main Street gate, as well as online at drive.milbstore.com. The Drive Team store is the place to stock up on Drive and Red Sox apparel, caps, jerseys, novelty items and much more. - The Reading All-Stars program, sponsored by Michelin, N.A. and the Greenville Drive, is a proven reading incentive program designed to promote reading enjoyment and academic success among the youth through the excitement and appeal of Greenville Drive baseball. Since the program was launched in 2008, over 600,000 students have participated in the program, and over 150,000 students have qualified across three school districts and two library systems. CLICK HERE for more information about Reading All-Stars. - All 70 home games, as well as select road games, are available to watch online with an MiLB.TV subscription. CLICK HERE for more information about MiLB.TV subscriptions. - Fans who attend a Drive game at Fluor Field are encouraged to park at County Square, which is located on University Ridge. Parking here is complimentary, and in partnership with the City of Greenville, trolleys will run through every 15 minutes to take fans to Fluor Field. The trolley service also runs during and after the game. - Items that are prohibited inside the Fluor Field gates include, but are not limited to, chairs, cigarettes, umbrellas, and vape pens. - If a Drive game at Fluor Field is postponed due to weather, your tickets can be exchanged at the Drive Box Office for a ticket to any remaining home game that season, subject to availability. You may not exchange your tickets if a game is delayed due to rain but is eventually completed that day. - The Drive have seen 80 players go "South to the Show" and reach the major leagues. CLICK HERE for a full list of Drive alums who have reached the major leagues. - Children ages 2 and under receive complimentary admission.